This post is a marriage of two different themes that have recently appeared at Bit Tooth. The first, under the Waterjetting title, has contained a discussion of the different aspects of high-pressure waterjet use. The second, more recent theme discussed both the original Stonehenge and then how the MS&T Stonehenge, which is a working calendar, functions. 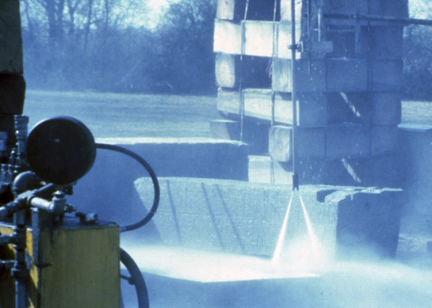 In this post I am going to talk about how the MS&T megalith was built, and since it involves the use of high-pressure water it seems appropriate to include it in the Waterjetting Series. As I have noted in one of the earliest waterjetting posts we had learned, from Russian literature, back in 1966 that waterjets could be used to cut into granite. From results of an unplanned test, we had learned that the pressures needed to cut through granite need not be that high. Others had predicted that it would take a jet pressure of up to 30-times the rock compressive strength in order to penetrate rock efficiently. However both the Russians and ourselves had been able to drill through a 30,000 psi granite with a waterjet pressure of only around 10,000 psi, rather than the predicted 900,000 psi. We had done this by moving the jet over the surface so that, as the jet passed across the cracks between grains, so it would penetrate and pressurize the crack, causing it to grow and remove the grain, without having enough pressure to cut through the grain itself. We had drilled this block of rock back in Leeds and the nozzle was pointing vertically downwards, as we rotated the rock beneath it. 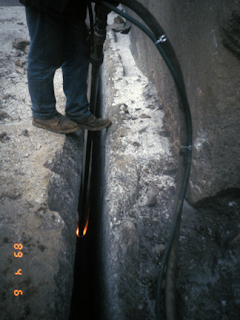 After drilling a shallow central hole, we stepped the nozzle out a short distance and repeated the process, breaking the outer ring of rock to the central core. Then after widening the hole, we could come back to the center and advance the nozzle into the rock, and repeat the process. Because of the nozzle size we had to continually step the hole to a smaller diameter as the hole got deeper, and thus there is a rapid taper to the walls. 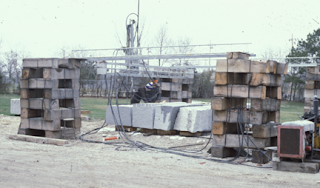 Moving forward to the early 1980’s when Chancellor Marchello asked Dr. Marian Mazurkiewicz and I to cut the rock for his Stonehenge, and we knew that we could cut the rock at a pressure below 15,000 psi (the size of the pump that we had at the time). But tests where we had made multiple passes over a rock had shown that, with a direct vertical cut to an edge, that repeated passes would taper the cut inward over time – naturally doing what we had done artificially at Leeds. Figure 2. Early tests on granite cutting. Note that the lower cut was made with two jets diverging at about 5 degrees, and the one above it with the jets diverging at 11 degrees. (The nozzle was spinning and moved across the face of the rock several times). These tests showed that we needed a higher angle to ensure that the sides did not taper, and while this could be achieved with the nozzles angled at 15 degrees to the perpendicular, because the jets had to cut a path wide enough for the nozzle to enter the slot, an angle of 45 degrees was used after a short series of experiments. Our team at the Rock Mechanics and Explosives Research Center (RMERC) had been asked to carve the rock, since we had just prior to the commission, been down in Georgia demonstrating to the granite industry there that waterjets were able to economically cut granite. Concurrently with showing that this could be economic we had also shown that the technique removed the respirable dust from the air that is generated with a flame-torch cut, and that the noise level would drop to industrially acceptable levels from the “jet engine roar” of a cutting torch. 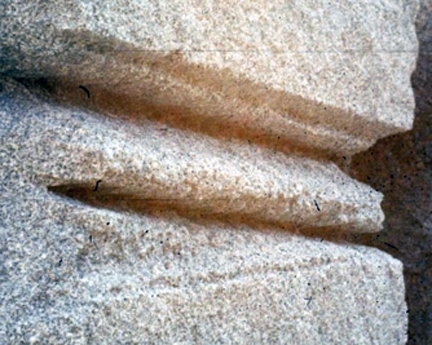 Figure 4 Showing the flame at the bottom of the burner spalling its way through the granite. Figure 5. Cutting granite with a flame-jet lance, Graniteville MO 1979. (Note the cloud of very fine particles of granite being blown out of the right side of the slot). The first thing to do in arranging to cut several hundred tons of granite was to find a source of supply. 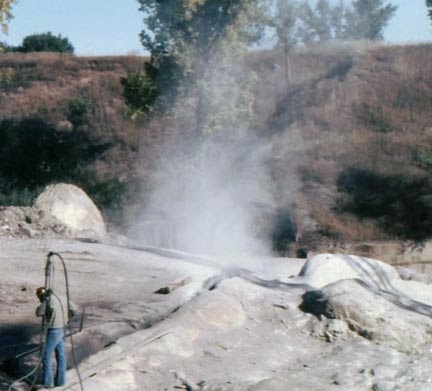 Unfortunately, at that time the granite quarries in the South-East part of Missouri were closed and other sites in the state did not prove practical. But because we had done the work with the Elberton Granite Association in Georgia, we were able to arrange to purchase rock from one of the Quarries around Elberton, Ga. They themselves had recently constructed their own version of the standing stones, the Georgia Guidestones although these had been cut to shape using flame jets, rather than water. Figure 6. 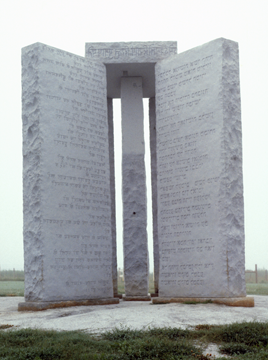 The Georgia Guidestones, Elberton GA. The granite blocks were roughly split to shape in the quarry, and then shipped to Rolla by train. The first block was sent by truck and this proved the benefits of rail, although the size of the cars limited the scale of the monument to half that of the original in the UK. 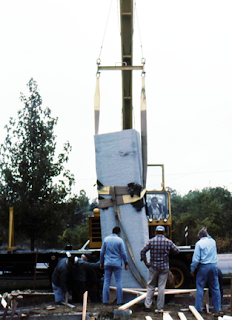 Which meant that the blocks – over 11 ft tall – were one-eighth the weight of the originals. Figure 7. Blocks of granite in the cutting frame. The cutting lance is the thin rod in the center of the picture. The blocks were brought to the RMERC and placed in position using a crane. Dr. Mazurkiewicz and his students had built this frame from wooden blocks, with the guide rails made from radio antenna mast. The lance moved on a cross-beam, also made from radio antenna mast. The low reaction force from the jets meant that the forces on the structure were very small. Thus the head itself could be pulled along the track using a bicycle chain, and small, fractional horse-power motors could be used to move the head and advance it into the slot. Although, by that time, self-rotating heads had been developed, it was decided that a better control of the cut edges could be achieved if the head was hydraulically rotated. Figure 8. Detail of the cutting platform. The two hoses feed a hydraulic motor that gear-drives the rotation of the cutting lance. 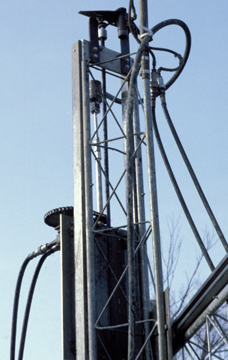 The high-pressure water feeds through the hose to a small swivel at the top of the lance. A small electric-motor driven screw behind the platform elevates and lowers it on the guide rails to advance the nozzle into the cut. In order to keep the slot width as narrow as possible the nozzle holder was made as small as the feed pipe, with the two jets issuing from small carbide inserts within the holder. Figure 9. Detail showing the nozzle holder and a nozzle orifice on the lance. 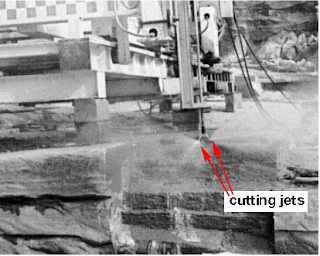 Experiments showed that an effective cutting rate of around 20-square feet an hour (depending on the direction of cut relative to the planes of the granite) could be achieved. The lance was rotated at 90 rpm, and moved down the cut at a speed of 9-ft per minute. 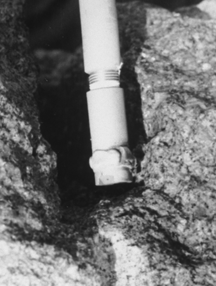 The two jets, at a pressure of around 14,000 psi (there was some pressure loss in the system) would cut into the rock around 1/3rd of an inch on each pass, and the lance would be lowered this amount after the pass, and then the direction reversed and the jets would cut back along the rock. (This is somewhat faster than the hand-held stone flattening of the original Stonehenge rocks in England, although studies in Peru, where a similar technique was used to shape to blocks that build Machu Picchu showed that it is possible to flatten about 1 square foot an hour once you learn how to chip the rock). 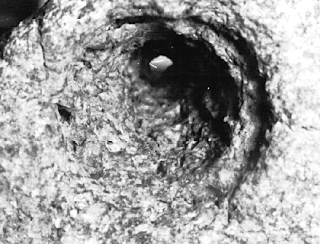 Professor Parker Pearson has also noted that the UK original had the rocks finally shaped after they had been erected). Figure 10. Showing the jet arrangement, raised after a side had been trimmed so that the jets could be seen. Normally with the jet in the cut there is little to show the cutting action. It took about a morning to cut one side of a block (or in later stages to cut one of the large blocks in half for the smaller stones). Once the second side had been cut, the block was turned and the rail aligned to cut the third and fourth sides. Overall, given that the operations had to be shut down during the winter where the temperatures were below freezing, the blocks were cut and completed over the course of two semesters, largely working with undergraduate student labor. After the blocks were cut, they were taken to the site, where each was placed in position using a crane. Because of the precision required to align the blocks with the sun, this was a time-consuming operation. The major standing stones were then held in place with an additional pour of 18-inches of cement. (They stood on a cement platform). Figure 11. Lowering a block into place. The monument was dedicated at the Mid-summer solstice in 1984, with John Bevan, a Druid of the Gorsedd performed the dedication. Figure 12. 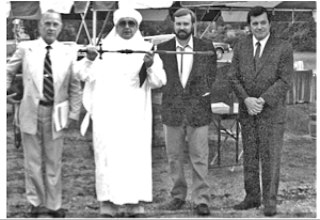 Speakers at the Dedication: Dr. Joe Senne – who designed the megalith; John Bevan – Druid; Dr. John Carlson – from the Center for Archaeoastronomy; Dr. Joseph Marcello – Chancellor. 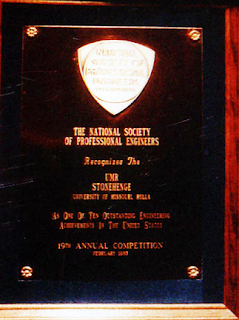 The construction was sufficiently novel that it was awarded one of the ten Engineering Awards from the Society of Professional Engineers.